I'm a long time Vonage customer and I have a very old Vonage Motorola VT1005 VOIP Router that they gave me when I signed up way back in 2003. It turns out that this box can't handle all the action that Bit Torrent sends its way; something about a limited size of the NAT table not working with the large number of connections opened by Bit Torrent. Typically it needs to be reset at least once a day when any sort of Bit Torrent activity is going on. The solution is to keep the poor VT1005 out of the way of all that traffic. Instead of using it as your main router, stick it behind something more up to the task, like an Apple Airport Extreme. 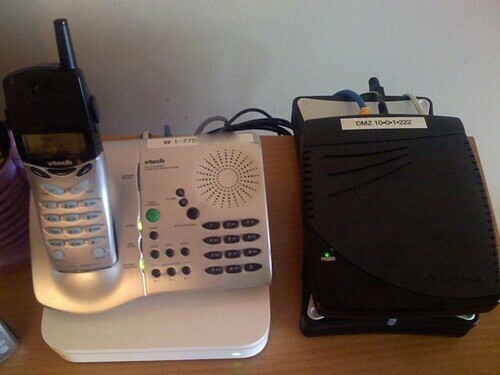 Of course the VOIP functionality works best if there is no firewall between it and the network at large. The solution to this is to put the VT1005 in the DMZ of your main router. To do this you first need to make sure the VT1005 has a static IP address. You can set this on using the web interface of the VT1005. After that, go to the admin interface for your main router and set this new IP address as the DMZ IP address. On the Airport Extreme this setting is called Enable Default Host, as you can see in the image above. There are a few other issues to be aware of when dealing with the VT1005. It has an advanced setting so you can disable NAT and put it in bridge mode. This seems like a good idea since it ought to avoid the NAT table explosion, but that solution seems to have the same daily reset issue. Also, it's a bit tricky to get back to the web interface of the VT1005 if you've put it into bridge mode. There is no way to get to the device after that! The trick is to directly connect your computer to the VT1005's PC port and set the IP address of your computer statically to 192.168.102.2 with the gateway set to 192.168.102.1. Then point your browser to http://192.168.102.1/ and you'll be able to change the NAT settings again. Finally, make sure you have the VT1005 set to use the factory MAC address. I was trying to fake out my ISP and set the MAC address to the same number as my Airport Extreme. This will work if you ISP gives you more than one IP address and you're in bridge mode (NAT disabled). But it won't work if the Vonage box is setup in your DMZ. Your router and the computer in the DMZ can't have the same MAC address or things just won't work.